New Orleans Z’hulus Jazz Band on 2015 UK Tour with Emile Martyn (drums), Dan Vercruysse (trumpet) and Philippe De Smet (trombone), at Farnborough Jazz Club, Kent on 22nd May 2015. Photo by Mike Witt. Brian Turnoch (d.bass) – UK &Belgium ‘The New Orleans Z’Hulus Jazz Band’ ending their 2016 UK Tour at Farnborough Jazz Club, Kent on 22 May. Photo by Mike Witt. 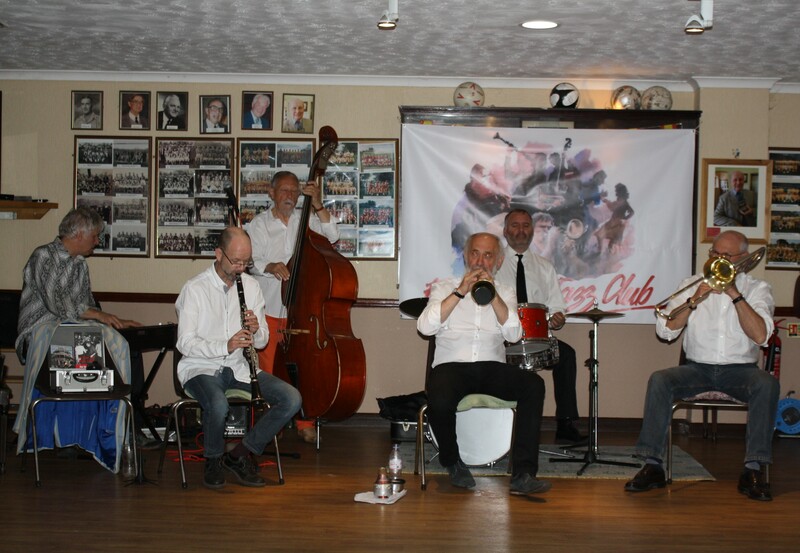 The NEW ORLEANS Z’HULUS are over on their 2018 UK Tour and playing their finale with us Friday, 14th September 2018. 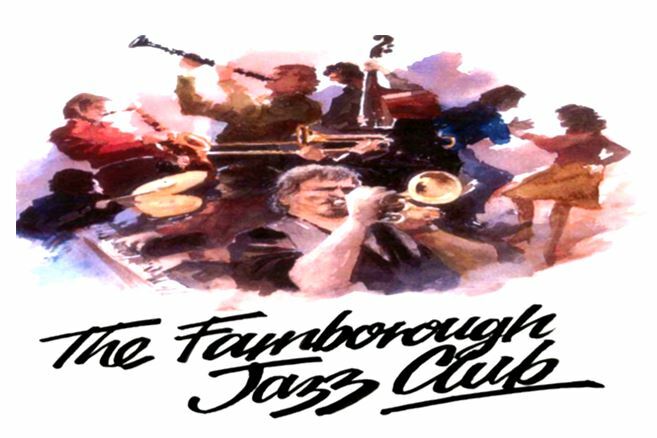 So come and join us here at FARNBOROUGH JAZZ CLUB (Kent) and. and make it the best evening for them to go home on. We are a fun club, with lots enjoying ‘a light fantastic’ and and many enjoying just listening. I’ll fill you in again that this international band was put together by band leader, BRIAN TURNOCK. 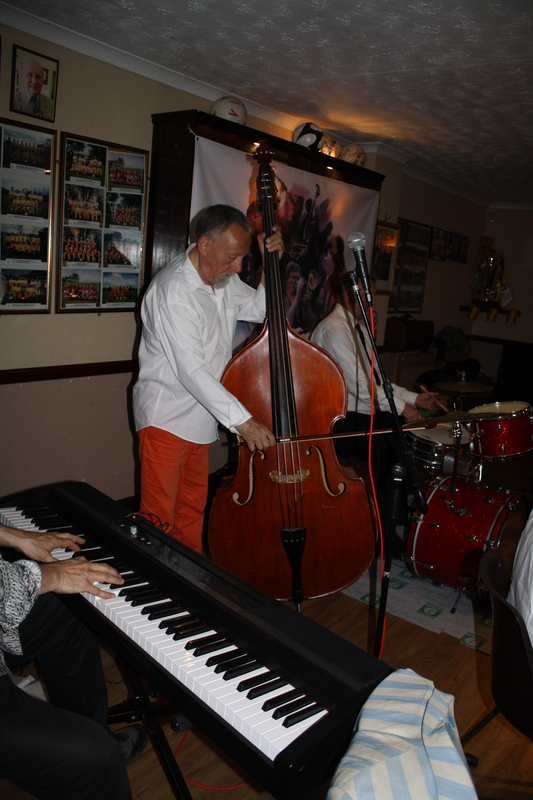 Brian lives between U.K. and Belgium and plays double bass. 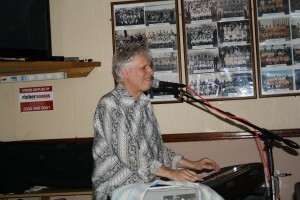 He has recorded with many ‘greats’ such as George Lewis and Lil Armstrong. 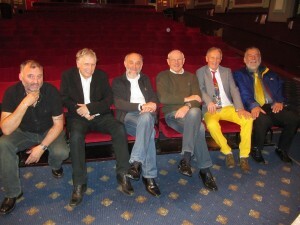 Brian chose to put together the great talents of the two BELGIANS ,trumpeter DAN VERCRUYSSE and trombonist PHILIPPE DeSMET, plus FRENCHMAN, clarinettist ‘BOSS’ QUEROD and certainly not least, English musicians, banjoist PAUL SEALEY (10yrs with The Chris Barber’s Band) and definitely not least, drummer EMILE MARTYN. Emile lives between England, BELGIUM and the U.S.A. (frequently visiting his Dad, famous band leader Barry Martyn – now living in New Orleans). This entry was posted in New Orleans Z’hulus from Belgium on September 14, 2018 by Diane. We have a great band for you – the NEW ORLEANS Z’HULUS from Belgium playing for us tomorrow night, Friday, 16th June 2017. 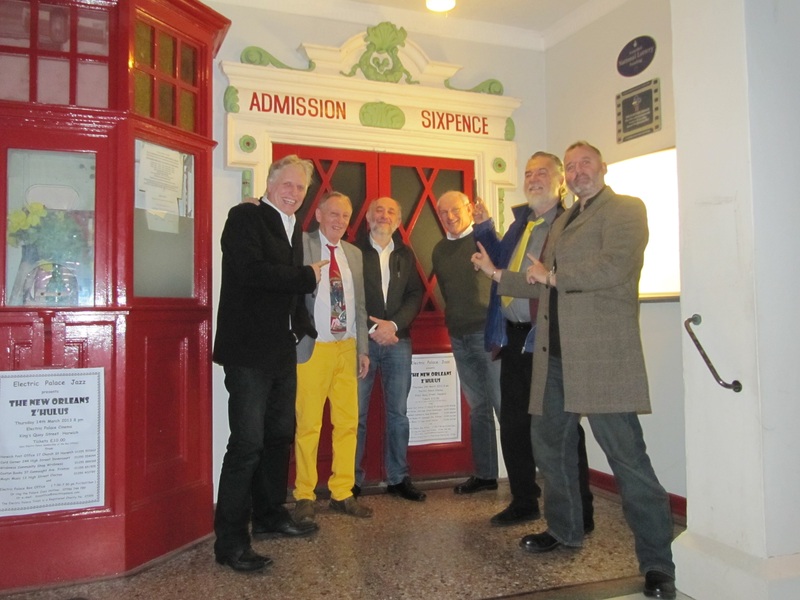 Their last appearance here at FARNBOROUGH JAZZ CLUB (Kent) was two years ago, so make the most of this visit, because we may have to wait a long time again for their next visit. As you can see and as I said last time, this band has a wonderful International flavor, (a couple of changes from last time). 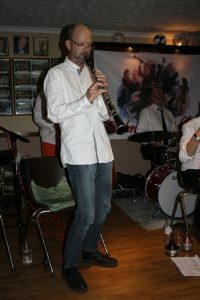 We have trumpeter DAN VERCRUYSSE, who is from BELGIUM. 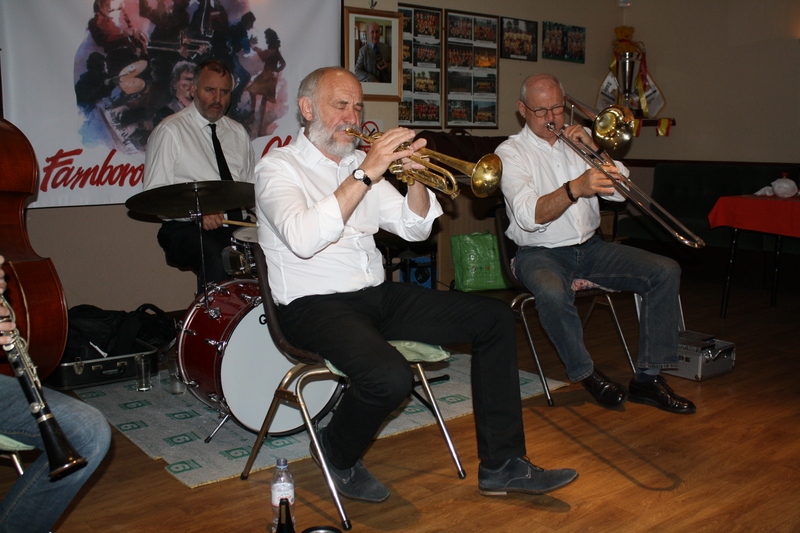 Then there’s trombonist PHILIPPE DeSMET, who also fares from BELGIUM. 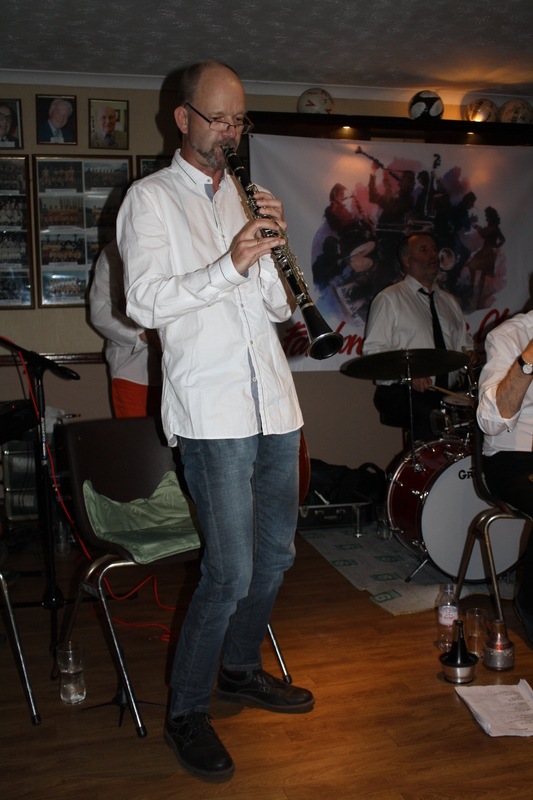 Plus clarinettist BOSS QUEROD, who is from FRANCE. Then we have three English musicians. 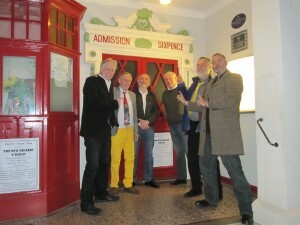 First of all, a great treat for you, banjoist, PAUL SEALEY (10yrs with Chris Barber’s Band). Second, there’s leader of the band, BRIAN TURNOCK. Brian lives between U.K. and Belgium and plays double bass. Brian has recorded with many ‘greats’ such as George Lewis and Lil Armstrong, Plus third, of course you all know drummer EMILE MARTYN, who lives between U.K. and U.S.A, (frequently visiting his Dad, famous band leader Barry Martyn – now living in New Orleans). I am really looking forward to having this band back again at Farnborough. We are so lucky to have such talent here, don’t you think. This entry was posted in New Orleans Z’hulus from Belgium on June 15, 2017 by Diane.